To provide laboratory, technical services, onsite assistance, and resources to the City of New York and beyond. (For city agencies, the Mayor’s office, organizations, communities, gardeners, urban farmers, researchers, industries, and practitioners etc). Recommended for contamination concerns (A common problem in NYC) , especially if growing edible or interacting with the soils. pH gives a measure of soil acidity; very valuable information. It determines: availability of nutrients and contaminants, microbial processes, and plant growth. Optimal pH ranges are plant-specific. Recommended for soils or plants showing signs of stress. Excessive salts can from natural or synthetic fertilizers, road salt, and other sources. This condition can cause water and nutrient stresses in plants, and can also affect soil structure and microbes. We measure dissolved salts with an electric conductivity probe in a 1:2 soil:water extract. Recommended for knowing what kind of soil you have. Texture class is a measure of the sand, silt, and clay content (foundation of soils) in the soil, which reveals drainage and water holding capacity, absorption and supply of nutrients or contaminants, capacity for amendments, plant selection, best uses etc. Recommended for evaluating general health and amount of nutrients available for plant growth. Out of the nutrients, these macronutrients are needed by plants in the largest quantities. We use the Rapitest to measure total nitrogen, phosphorus and potassium. This is a combination package for Heavy Metal Screening (XRF), pH Test, Soluble Salts, Texture Class and Nutrient Testing. This test will give you the information you need to determine soil health and fertility - perfect for any home gardener. *If you purchase this test for a given sample, do not purchase any of the other tests for that same sample - they are all included! Step 1: Observe your area and determine what soil you want tested and why. This will help you determine where to take samples, at what depths, and how many separate samples to submit. In general, it is recommended to take several samples (3-10 depending on the size of the plot) from one area of interest and combine them into 1 representative sample from which you will extract 1 cupful of soil for testing. This should be done separately for each area of interest. For each are of interest, one combined sample should be submitted with its own submission form (see below for more details). If you have more than one area of interest, you will have more than one sample to submit. 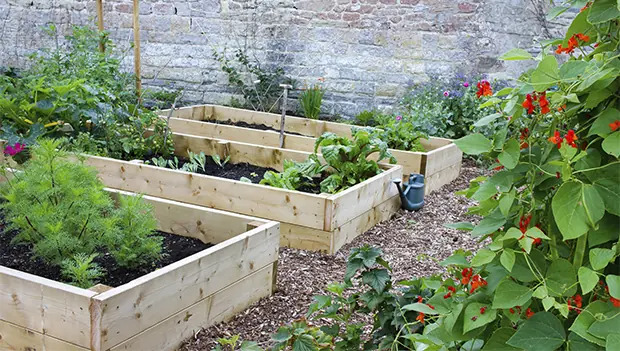 If you are concerned about growing vegetables in general, please take from the top to 6-8 inches deep. If you are concerned about contamination in the upper part of the soil (contamination near to the surface where you are most likely to be exposed and where splash up can transfer potential contaminants onto the plant), then collect samples from the top to 3-4 inches deep (0-3”). If you are concerned about soil contamination from surface to root zone, take a sample from 0 to 6-8 inches deep. Step 2: Use a spade or trowel to take small samples of soil from 3 or more random, evenly-distributed spots from each chosen area of interest (see above for definition) and put all soil in a clean container (a bucket, or large bag). Thoroughly mix up the soil in the container. Remove pebbles, leaves and plant roots. Transfer at least one cup of the soil mixture (~0.5 lb about 1 sandwich-bagfull) to the plastic bag and seal. Don’t overfill the bag because it will be flattened if mailed in an envelope. 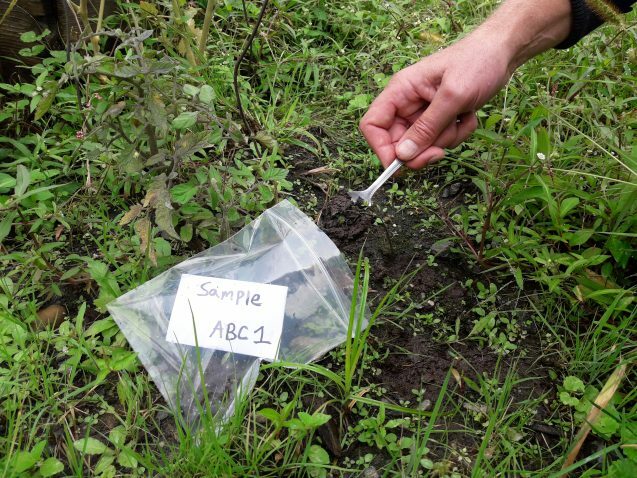 Step 3: Using a permanent marker, label each sample with an ID that helps you remember the location of the soil sample. This ID should match the ID on the submission form. It is critical for us to be able to be able to deliver accurate results to you, so the label on your bag should match the label on your submission form. If a sample is not clearly labeled, we will contact you via email to ask for additional information to help us identify each sample, or ask you to resubmit a soil sample. Please be sure to indicate which sample bag is associated with each form in the sample description or in any other blank space on the form in case the form and corresponding sample bag get separated. If you intend to pay using PayPal, please indicate ‘PayPal’ in the Payment Type box. You can also pay for our soil testing services using PayPal, simply order below! Please allow 3 weeks for sample processing. We will send your results to the email address indicated on the form. Thank you for getting your soil tested with the NYC Urban Soils Institute! If you have any questions about soils, visit our Soils Cafe – we’re sure that it has the information you need! Many community gardeners are able to have their soil tested. However, they lack the technical knowledge to properly interpret the test results, rendering the tests meaningless. While there are legal reasons why laboratories shy away from providing site specific interpretations, we will explore ways in which we can provide information useful to gardeners. Offering workshops on nutrients and contaminants in urban soils as well as creating a digest on research studies and connecting academia with the professional and lay community through seminars are some of the strategies we implement to address this need.